Who did the Urinal? Not Duchamp! say Glyn Thompson and Julian Spalding in their Summerhall Festival exhibition titled ‘A Lady’s Not A Gent’s’. 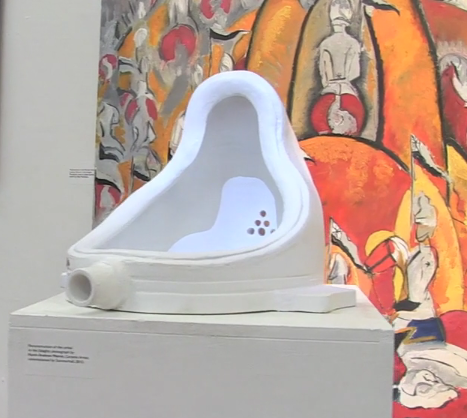 Thompson and Spalding claim the submission of the urinal (aka ‘Fountain’) to the Independents exhibition of 1917 was made by poet/artist Elsa von Freytag-Loringhoven. This was a gesture aimed personally at Duchamp and politically at America for entering the WW1 against Germany in 1917. But ‘Duchamp’s urinal’ has for many become a seminal work contributing to the less critical or analytical forms of Conceptual Art as the source of Don Judd’s tautology of ‘what the artist calls art, is art’. Thompson attributes the ‘readymade’ and the assertion of everyday less-traditionally aesthetic objects as art to Breton’s ambition to include Duchamp within Dada. This exhibition at Summerhall finds Spalding and Thompson on a roll, with a lengthy exchange with Sir Nicholas Serota published this month in The Jackdaw (www.jackdaw.co.uk) building up a body of evidence that not only was the ownership of a Urinal copy (purchased by the Tate for £500,000) wrongly attributed but that Elsa’s conceit in submitting it to the Independents in 1917 has been entirely misunderstood. The exhibition It is currently located in the long corridor at Summerhall.